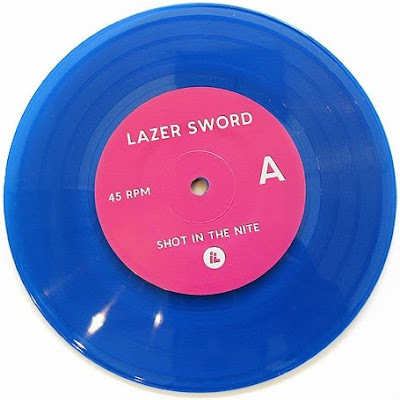 After fantastic The Golden Handshake EP, Low Limit and Lando Kal, acting together again as LAZER SWORD, has released a limited blue vinyl 7" with most surprising, infectious, cheesy-as-hell and shower-friendly track I've heard in a while, namely Shot in the Nite. Since the first hearing, it kinda stuck in my head and now emerges from time to time in most unexpected moments as if shot into my brain by some heavy-duty bionic commando :) A very peculiar tribute to disco funky happiness of the 70's/80's, pure hedonistic uplifting pleasure with uniquely Lazer Sword mutated and crunked up synths. Let's sing and dance together boys and girls to this BANGERRRRRRRRRRRRR !!! This is the tune I could easily bear being played twenty times a day on mainstream, commercial radio stations :) The best tool to create havoc on any dancefloor. Blap to the Future!!!! In Koopa Boss Mode, the Trapperkeeper meets 3D Action Jackson to deliver the usual plunderphonic madness with plenty of sick samples and cut-up beats squashed together, reprocessed and then spat out on you with head-nodding force. Slow but effective banger! Limited clear blue vinyl (1000) available via Stones Throw Store. You better hurry! (mp3 in digital format also available via this site). LAZER SWORD - SHOT IN THE NITE / KOOPA BASS MODE 7"